Elizabeth, as anyone who knows her can attest, is One Tough Cookie. She shrugs off injuries that would have most children (and some adults) wailing for sympathy. When she was nine years old she hurt her arm in a fall from her pony, but was so stoic and casual about it that a week went by before we realized that it shouldn’t still be bothering her, took her to the doctor, was sent to the ER for x-rays and learned that it was in fact BROKEN. She has had two concussions, neither of which slowed her down for more than a few days, and any number of cuts, scrapes and bruises which barely merited her notice. She is Not A Whiner. She is Stoic and Hardy and Resiliant. I scurried down the ladder and into the house and back to the bathroom. Elizabeth was hunched over the sink, looking almost as white as the countertop. 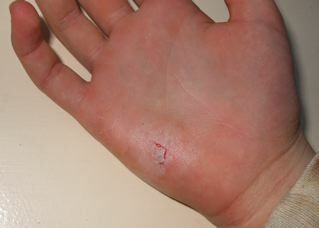 I took the towel off her hand again, took a close look at the gouged palm and saw…a very minor flesh wound. It had already stopped bleeding. I almost made a snarky comment about the fuss she was making over such a tiny thing, but then I saw that her hands were shaking. “Are you afraid?” I asked, trying not to sound as baffled as I felt. “No, Baby,” I assured her gently. “This isn’t going to need to be amputated. Stay here, I’m going to go get some stuff from the first aid kit.” She still looked terrified so I added softly, “Don’t be afraid. This is absolutely not the kind of wound that would require an amputation.” I fetched the stuff, dabbed some Neosporin on the cut and covered it with a Band-Aid. She was a little wobbly on her legs as she followed me out of the bathroom, so I suggested that she lie down on the sofa until she felt better. She readily agreed. Later, when she was back to her old self again, I asked her what it had been about that little cut that had scared her so badly. She said it had bled quite a lot at first, and she’d been afraid of bleeding to death. There’s no trace of a blood trail from the yard to the bathroom, and the hand towel hadn’t had much blood on it, so I’m at a loss to understand her perception of this tiny gash as something life-threatening. She’s bled worse from bigger wounds and hardly noticed. I’m glad that it wasn’t actually serious, but I’m completely boggled by her overreaction. Is there a phobia that involves ladder-inflicted injuries, maybe? This morning she was back to her old unique brand of normal: she wore a pair of thin, stylish leather gloves to school so that no one would see the cut on her hand and ask “annoying questions.” She likes to maintain an appearance of being bulletproof, unbreakable, invulnerable to damage. In all honesty, yesterday’s minor meltdown was puzzling but oddly reassuring: it’s nice to know that there are moments when she’s as human as the rest of us. I guess even the toughest cookie needs to crumble now and then. ya know, I wonder if it’s that whole thing about Major problems we can deal with, like broken bones, concussions.. but it’s the little things that really trip us up if we’re out of focus. Hopefully this was just a passing panic, or maybe a little disorganized thinking that’ll clear up. All cookies go through phases. She’s older now, has read more, knows more. Information and reasoning can sometimes be a scary thing. I had a Duck that didn’t even blink when it came to shots at the doctor’s office. This year she has decided that that is a NEEDLE and that DOES hurt! And here I thought I got out lucky! The nurses assure me that this will pass. She’s just older and can reason that these shots do hurt. Hoping that we get to the ‘let’s get this over with’ stage really quickly! I saw the gloves by her side during today at School and I was wondering what was up with them but never had a chance to ask her. She did point out to me that her mom was going to be posting something “funny” today on her blog. I asked her if it was something about Elizabeth and she kinda giggled and said yes. She’s so dang cute! I love conversing with her.